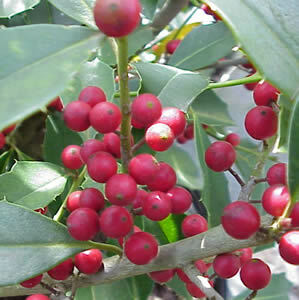 Savannah Holly is an older selection of a cross between Ilex cassine (Dahoon Holly) and Ilex opaca (American Holly). Ilex x attenuata ‘Savannah’ has whitish bark with light green leaves with very small spines. The females produce berries that are bright red. Savannah Holly tolerates limy soils well and will get 20-30 feet in height and 15 feet wide making it great for tall screens.